Imagine that you’re reading a book. The old-school kind, with actual pages that you turn. For the most part, this book tells a fairly conventional story, albeit one written in a uniquely elegant prose style. Perhaps there’s a preface that self-consciously acknowledges the author’s presence and the inherently deceitful nature of fiction, along the lines of what Milan Kundera does in The Unbearable Lightness Of Being. After that, though, it becomes a straightforward novel, with compelling characters engaged in dramatic turmoil. You’re at roughly the book’s midpoint, and things are really heating up—some conflict that’s been long brewing is now threatening to boil over. Now imagine that as you finish reading the sentence that finds this intensity at its absolute apex, the page upon which it’s printed suddenly bursts into flame. Or maybe it disintegrates. Or all of the letters that make up the following sentences slide off the paper and onto your lap. Imagine that the integrity of the book itself—the actual object—appears to have been compromised by the terrible events occurring within, so that it’s briefly unclear whether you can even keep reading. Obviously, that’s not possible with a book. Nor can such a rupture take place in most other artistic media. If there’s something apparently amiss with a painting (see most any Magritte, for example), you can spot it immediately; it doesn’t impose itself unexpectedly. The movie projector, however, and the audience’s awareness of how it functions, provide an unusual opportunity to mess with the viewer’s head. Ingmar Bergman takes startling advantage of that opportunity almost precisely midway through Persona, a film that opens with the twin elements of a projector’s carbon arc lamp blazing to life. 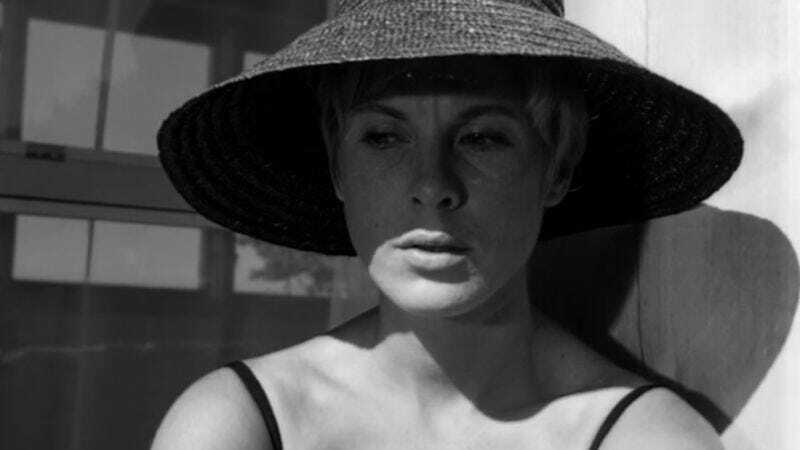 The focus soon shifts to a mute, psychologically damaged actress, Elisabet (Liv Ullmann) and the nurse, Alma (Bibi Andersson), who’s tending to her, with Bergman’s initial self-reflexivity completely vanishing. But it returns with a vengeance when Alma gets pissed off at Elisabet, who’s been furtively treating her like an abnormal case study, and decides to take some passive-aggressive revenge. As I watch this disturbing scene again, its most curious aspect seems to me not the rupture itself, but Bergman’s choice of where to place the camera when Alma first heads outside. For some reason, he opts to shoot most of the significant action as a single unbroken take from quite some distance away, and at an oblique angle. For most directors, the natural inclination would be to move in closer much earlier than Bergman does, perhaps right before Alma picks up her hat and accidentally knocks her water glass to the ground. (Andersson does a superb job of making this action look entirely natural rather than preplanned, which isn’t as easy as it might seem.) To remain at that distance when Alma notices the shard of broken glass she’d missed while cleaning up, spies Elisabet heading outside, and quickly replaces it, is downright perverse. You can’t even see the shard of glass—it’s necessary to infer what must be happening. Give this scene as scripted to 100 filmmakers and 99 of them would make damn sure to get a clear shot of Alma picking the shard up and then putting it back. Bergman almost seems to be dangling a sliver of hope to the viewer: Maybe the situation isn’t as ugly as it appears to us from way over beyond those two trees. When he does finally cut to a closer shot of Alma, the cruel teasing continues. Alma stares blankly ahead as Elisabet passes behind her in the house, then glances down at the spot where we know the object she picked up and replaced must be. But we still don’t see it. Not until Elisabet’s bare feet step over the shard of glass does the camera quickly—sharply, one might say—pan over to confirm our worst fears. (In the context of the film, Alma doing something so vindictive is genuinely shocking.) Another feint follows, with Elisabet again walking safely past the shard of glass while Bergman pans from her feet over and up to frame the back of Alma’s head. This isn’t exactly Hitchcockian suspense, given that it’s just a potentially nasty cut rather than the proverbial time bomb, but the precise sequence of shots and camera movements that Bergman employs over these few seconds is nonetheless very effective. And it’s significant—given Persona’s explicit doubling theme—that Elisabet finally steps on the shard and cuts herself the instant that Alma exits the frame (and enters the house), leaving her alone. How Elisabet knows that Alma left the shard of glass there intentionally, meaning to harm her, is uncertain. Maybe it’s just the fact that Alma is looking out at her from the house, with an expression of mild curiosity rather than solicitude. (Note that the composition has Alma’s head neatly divided by the curtain, with one eye visible and one eye shrouded. Later, half of her face will be replaced by Elisabet’s, and vice versa.) In any case, it’s clear from Elisabet’s pained gaze that she understands exactly what happened… and it’s at this moment, in the midst of this stare down, that the movie itself implodes. I’m not sure whether Persona features the first fake projector breakdown in cinema history, but it’s hard to imagine now just how radical that shudder and clackety-clack and ostensibly burning celluloid (is that hand-animated?) must have seemed to audiences in 1966. When Thai filmmaker Apichatpong Weerasethakul did something similar in Tropical Malady a decade ago, I initially thought it was an actual projection error. And I’d seen Persona, as well as Two-Lane Blacktop (which pulls this trick at the end). For people completely unprepared for such an avant-garde move, the disorientation must have been extreme. It’s as if the machinery can’t handle the abrupt change of gears the narrative has just made, and simply fails. This rupture leads to a brief reprise of images from the surrealistic montage that opens the movie (which I’d originally planned to write about for this piece, incidentally—I changed my mind because it turns out that dozens of people have already analyzed that montage in depth). The horizontal veins on an eyeball dissolve into the vertical folds of a curtain, and a figure, which turns out to be Elisabet, walks through the curtain, abstractly out of focus. Atonal music accompanies her as she walks toward the camera, and then there’s a sudden sting as the image snaps into perfect focus (presumably thanks to someone placing a lens when there had previously been none). This instantaneous return to “normal” is nearly as jarring as the breakdown was, and the whole interlude signals that Persona has experienced an irreversible schism of some kind, which will soon become even clearer as Alma and Elisabet proceed to meld both figuratively and literally. This is one of the most audacious gambits in cinema history, employing means that only cinema possesses. Nearly half a century later, it still has the power to evoke a feeling of extreme mental trauma.